These are a few excerpts I have chosen from the Bible. They are not the complete, original versions. If you wish to see those, you can look them up in the Bible yourselves; to save time, I have omitted part of the original content. Here I have only selected several key passages and sentences, leaving out several sentences that have no bearing on our fellowship today. In all the passages and content we fellowship about, our focus skips over the details of the stories and man’s conduct in the stories; instead, we only speak of what God’s thoughts and ideas were at the time. In God’s thoughts and ideas, we will see the disposition of God, and from everything God did, we will see the true God Himself—and in this we will achieve our objective. The passages above contain several key words: numbers. First, Jehovah said that if He found fifty righteous within the city, then He would spare all the place, which is to say, He would not destroy the city. So were there, in fact, fifty righteous within Sodom? There were not. Soon after, what did Abraham say to God? He said, Peradventure there shall be forty found there? And God said, I will not do it. Next, Abraham said, Peradventure there shall thirty be found there? And God said, I will not do it. And peradventure twenty? I will not do it. Ten? I will not do it. Were there, in fact, ten righteous within the city? There were not ten—but there was one. And who was this one? It was Lot. At the time, there was but one righteous person in Sodom, but was God very stringent or exacting when it came to this number? No, He was not! And so when man kept asking, “What about forty?” “What about thirty?” until he got to “What about ten?” God said, “Even if there were only ten, I would not destroy the city; I would spare it, and forgive the other people besides these ten.” Ten would have been pitiable enough, but it turned out that, in fact, there was not even that number of righteous people in Sodom. You see, then, that in the eyes of God, the sin and evil of the city’s people were such that God had no choice but to destroy them. What did God mean when He said that He would not destroy the city if there were fifty righteous? These numbers were not important to God. What was important was whether or not the city contained the righteous that He wanted. If the city had but one righteous person, God would not allow them to come to harm due to His destruction of the city. What this means is that, regardless of whether or not God was going to destroy the city, and regardless of how many righteous were within it, to God this sinful city was cursed and execrable, and should be destroyed, should vanish from the eyes of God, while the righteous should remain. Regardless of the age, regardless of the stage of mankind’s development, the attitude of God does not change: He hates evil, and cares about the righteous in His eyes. This clear attitude of God is also the true revelation of the substance of God. Because there was but one righteous person within the city, God hesitated no longer. The end result was that Sodom would inevitably be destroyed. What do you see in this? In that age, God would not destroy a city if there were fifty righteous within it, nor if there were ten, which means that God would decide to forgive and be tolerant toward mankind, or would do the work of guidance, because of a few people who were able to revere and worship Him. God places great stock in man’s righteous deeds, He places great stock in those who are able to worship Him, and He places great stock in those who are able to do good deeds before Him. In the accounts of the Bible, were there ten servants of God in Sodom? No, there were not! Was the city worthy of being spared by God? Only one person in the city—Lot—received God’s messengers. The implication of this is that there was only one servant of God in the city, and thus God had no choice but to save Lot and destroy the city of Sodom. These exchanges between Abraham and God may seem simple, but they illustrate something very profound: There are principles to God’s actions, and prior to making a decision He will spend a long time observing and deliberating; before the time is right, He will definitely not make any decisions or jump to any conclusions. The exchanges between Abraham and God show us that God’s decision to destroy Sodom was not in the slightest bit wrong, for God already knew that in the city there were not forty righteous, nor thirty righteous, nor twenty. There were not even ten. The only righteous person in the city was Lot. All that happened in Sodom and its circumstances were observed by God, and were as familiar to God as the back of His own hand. Thus, His decision could not be wrong. In contrast, compared to the almightiness of God, man is so numb, so foolish and ignorant, so short-sighted. This is what we see in the exchanges between Abraham and God. God has been issuing forth His disposition from the beginning until today. Here, likewise, there is also the disposition of God that we should see. Numbers are simple, and don’t demonstrate anything, but here there is a very important expression of God’s disposition. God would not destroy the city because of fifty righteous. Is this due to the mercy of God? Is it because of His love and tolerance? Have you seen this side of God’s disposition? Even if there were only ten righteous, God would not have destroyed the city because of these ten righteous people. Is this, or is it not the tolerance and love of God? Because of God’s mercy, tolerance, and concern toward those righteous people, He would not have destroyed the city. This is the tolerance of God. And in the end, what outcome do we see? When Abraham said, “Peradventure ten shall be found there,” God said, “I will not destroy it.” After that, Abraham said no more—for within Sodom there were not the ten righteous he referred to, and he had no more to say, and at that time he understood why God had resolved to destroy Sodom. In this, what disposition of God do you see? What kind of resolution did God make? That is, if this city had not ten righteous, God did not permit its existence, and would inevitably destroy it. Is this not the wrath of God? 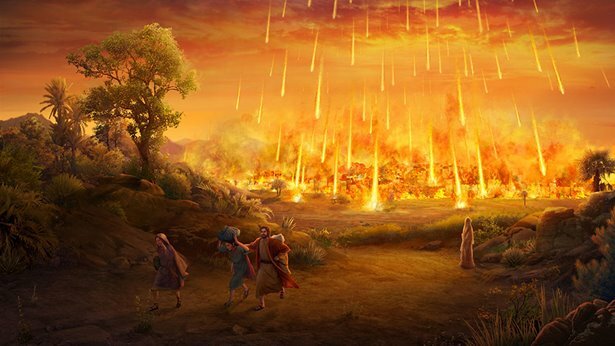 Does this wrath represent God’s disposition? Is this disposition the revelation of God’s holy substance? Is it the revelation of God’s righteous substance, which man must not offend? Having confirmed that there were not ten righteous in Sodom, God was certain to destroy the city, and would severely punish the people within that city, for they opposed God, and because they were so filthy and corrupt. Why have we analyzed these passages in this way? Because these few simple sentences give full expression to God’s disposition of abundant mercy and profound wrath. At the same time as treasuring the righteous, and having mercy upon, tolerating, and caring about them, in God’s heart there was a deep loathing for all those in Sodom who had been corrupted. Was this, or was it not, abundant mercy and profound wrath? By what means did God destroy the city? By fire. And why did He destroy it using fire? When you see something being burned by fire, or when you are about to burn something, what are your feelings toward it? Why do you want to burn it? Do you feel that you no longer need it, that you no longer wish to look at it? Do you want to abandon it? God’s use of fire means abandonment, and hate, and that He no longer wished to see Sodom. This was the emotion that made God raze Sodom with fire. The use of fire represents just how angry God was. The mercy and tolerance of God do indeed exist, but God’s holiness and righteousness when He unleashes His wrath also show man the side of God that brooks no offense. When man is fully capable of obeying the commands of God and acts in accordance with God’s requirements, God is abundant in His mercy toward man; when man has been filled with corruption, hatred and enmity for Him, God is profoundly angry. And to what extent is He profoundly angry? His wrath will keep on until God no longer sees man’s resistance and evil deeds, until they are no longer before His eyes. Only then will God’s anger disappear. In other words, no matter who the person is, if their heart has become distant from God, and turned away from God, never to return, then regardless of how, to all appearances or in terms of their subjective desires, they wish to worship and follow and obey God in their body or in their thinking, as soon as their heart turns away from God, God’s wrath will be unleashed without cease. It will be such that when God deeply unleashes His anger, having given man ample opportunities, once it is unleashed there will be no way of taking it back, and He will never again be merciful and tolerant of such man. This is one side of God’s disposition that tolerates no offense. Here, it seems normal to people that God would destroy a city, for, in God’s eyes, a city full of sin could not exist and continue to remain, and it was rational that it should be destroyed by God. Yet in that which happened prior to and following His destruction of Sodom, we see the entirety of God’s disposition. He is tolerant and merciful toward things that are kind, and beautiful, and good; toward things that are evil, and sinful, and wicked, He is profoundly wrathful, such that He is unceasing in His wrath. These are the two principal and most prominent aspects of God’s disposition, and, moreover, they have been revealed by God from beginning to end: abundant mercy and profound wrath. Most of you here have experienced something of God’s mercy, but very few of you have appreciated God’s wrath. God’s mercy and lovingkindness can be seen in every person; that is, God has been abundantly merciful toward every person. Yet very rarely—or, it can be said, never—has God been profoundly angry toward any individuals or any section of the people among you here today. Relax! Sooner or later, God’s wrath will be seen and experienced by every person, but now is not yet the time. And why is this? Because when God is constantly angry toward someone, that is, when He unleashes His profound wrath upon them, this means that He has long since detested and rejected this person, that He despises their existence, and that He cannot endure their existence; as soon as His anger comes upon them, they will disappear. Today, God’s work has yet to reach that point. None of you will be able to stand it once God becomes profoundly angry. You see, then, that at this time God is only abundantly merciful toward you all, and you have yet to see His profound anger. If there are those who remain unconvinced, you can ask that God’s wrath come upon you, so that you may experience whether or not God’s anger and His unoffendable disposition to man really exist. Do you dare?